It started with only one! Yes, it really did!!! I started with just one - now look at these beauties - LOL. Yikes they had better stop coming out with new products - where am I going to put them? 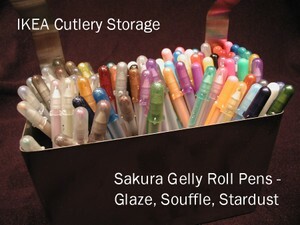 Gelly Roll pens - the name alone is rather addicting - why do they have to name everything after food items that are simply divine? Just thinking about the names makes me realize I need to go and eat some breakfast - now I'm hungry - LOL. It started with the Star Dust and to this day it is still my favorite Gelly Roll. Some people use the word glitter, other's say sparkle - but well I now have a new word thanks to the class with Karen the other night. 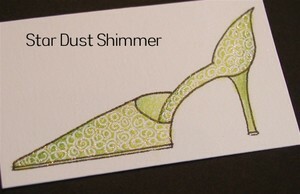 Her word is "shimmer" - and oh shimmer it does! What is so fabulous about this pen is that on cool tones it appears silver, on warm tones it appears gold. It is extremely difficult to photograph, but the effect it gives to your work will truly stun and amaze you. It just steps everything up a notch. You will never regret buying this pen as your first Gelly Roll. BUT I must add that if you buy this one... well look what happens. 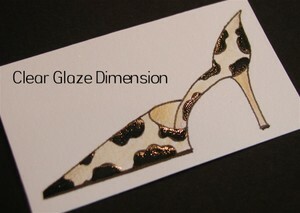 Click on the shoe below and it will pop up so that you can really see it SHIMMER!!! Then I added the Clear Glaze - another MUST have in my opinion. 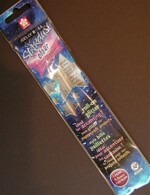 Most of you are familiar with Diamond Glaze or Crystal Effects - well this is that product in a pen! You can control it like none other, putting it in the smallest of places and the beauty of it is it dries quickly. On this Lockhart shoe the Clear Glaze just makes these shoes come to life - it is just incredible IRL. I've got to go eat something after this little review - LOL! I will continue with the Souffle pens a little later. oh no.. u got the gelly pen craze too... HAHAHA. i got the entire original collection and the stardust ones. i also have some of the japanese imports, where the ink's lighter and the tip is finer than gelly rolls. they're called "ballsign". I bought two white glaze pens and now you tell me there's souffle pens! I'm gonna git you for this, girl! What is your source for the Sakura pens? Do you have an internet company you like or just the lss? I've enjoyed reading your blog entries and hope you continue to introduce us to new products! Oh No!! You've just made me wanna go out and buy these. I don't even own one! Your examples are just too cool.Thanks!